Albertsons is doing away with offering Plated meal kits in many of its stores. After tests of the meal kits in Albertsons stores, Plated, which is owned by Albertsons, will now be offered only in select stores in northern California and Texas. “This shift will allow us to focus on innovation for the future expansion of Plated within the Albertsons Companies ecosystem,” Liz Marsh, spokesperson for Plated, told SeafoodSource. Albertsons rolled out Plated meal kits with much fanfare in numerous stores more than a year ago. While the kits were initially sold in 20 Safeway stores in Northern California and 20 Jewel-Osco stores in the Chicago area, Albertsons said the kits would be expanded to hundreds of its Albertsons and Albertsons’ branded stores, including Safeway, Vons, and Shaws, by the end of 2018. 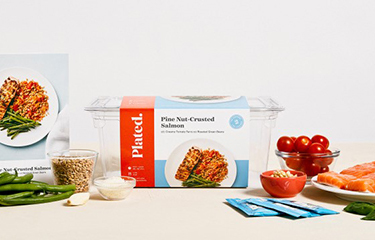 Plated’s lone seafood-focused in-store meal kit offering at the time was a Pine Nut-Crusted Salmon with Creamy Tomato Farro and Roasted Green Beans kit. Albertsons’ executives made the right move in reducing their focus on meal kits, Steven Johnson, grocerant guru at consultancy Foodservice Solutions, told SeafoodSource. Plated has “enjoyed the ability to test and learn on a large scale because of Albertsons Companies expansive footprint that covers a wide range of markets and store brands,” Marsh said. “We’ll continue to offer Plated in select stores while we temporarily reduce the overall scope of Plated’s retail distribution as we evolve its in-store presence. We remain committed to growing Plated to serve customers in new and exciting ways,” she added. Plated’s online meal delivery subscription service continues to be available across the lower 48 states. In related news, Brad Dickerson resigned as CEO of Blue Apron, a rival meal kit service, which has been suffering financial losses, according to Reuters.